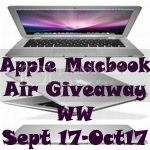 Here is an awesome giveaway event, "Apple Macbook Air Giveaway" brought to you by Pregnancy Forum for all of our wonderful readers. Sign -ups are open to bloggers July 20 to September 15, 2012. Any bloggers who post the announcement will get a free Rafflecopter entry link (choice of Facebook or Twitter). - Free link (Facebook or Twitter) with announcement. otherwise fee is $5.00 without announcement. Send payment to prettyinpinkmon[at]gmail[dot]com (as gift). - Additional links are $1.00 each. - Host space available for $10. - Those who refers the most bloggers to signup the event will get their Blog Name with a link back to their blog for free on the giveaway post. Please mention Jennie from "The Art of Jennie Yuen" referred you. Thanks so much!